The Palestinian issue has benefited from the Arab/Muslim talk, but — due to the Palestinian record of intra-Arab subversion — has never been supported by the Arab/Muslim walk. Arab/Muslim policy makers have never considered the Palestinian issue a strategic interest, but rather a tactical instrument to advance intra-Arab or Muslim interests and to annihilate the Jewish state. The elimination of Jews was the top priority of the grand mufti of Jerusalem, Haj Amin al-Husseini, the founder and president of the (Palestinian) Arab Higher Committee and a collaborator with Nazi Germany. In September 1941, he submitted a memo to Adolf Hitler on “the resolution of the Jewish problem in the Middle East in the same manner it is resolved in Europe,” planning the construction of Auschwitz-like crematoriums in the Dothan Valley, adjacent to Nablus in Samaria. In fact, Mahmoud Abbas recently expressed his admiration for al-Husseini as a hero and martyr. Abbas appointed the current grand mufti of Jerusalem, who continues al-Husseini’s anti-Jewish hate education. The limited role of the Palestinian issue was highlighted during the 1948 War of Independence. Jordan launched the war to eliminate the Jewish state, expand to the Mediterranean and advance the goal to dominate Greater Syria. Egypt and Saudi Arabia entered the war despite their inadequate military infrastructure, in order to abort Jordan’s imperialistic strategy. Iraq joined the war, aiming to control the oil pipeline from Iraq to Haifa. Syria assumed that the destruction of the Jewish state would facilitate the reassertion of Greater Syria. On Sept. 20, 1948, the Arab League recognized the Arab government of the whole of Palestine, but ignored it, declaring it null and void in 1951-1952, causing the U.N. to refuse Palestinian participation in the General Assembly proceedings. None of the Arab countries fought on behalf of, or due to, Palestinian Arab aspirations. They did not share with the Palestinian Arabs the spoils of war. Iraq occupied Samaria and transferred it to Jordan, which occupied Judea. In April 1950, Jordan annexed Judea and Samaria to the east bank of the Jordan River, naming it the West Bank. 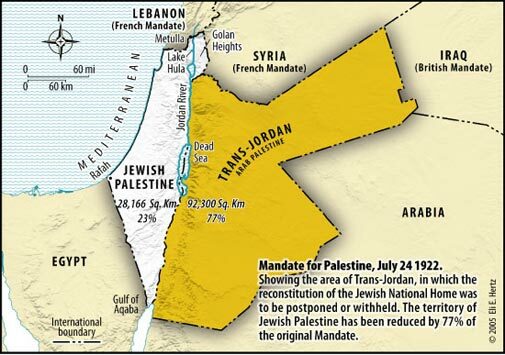 Egypt occupied Gaza and, just like Jordan, did not allow Palestinian nationalistic activities. None of the ensuing Arab-Israeli wars (1956, 1967, 1969-70 and 1973) were Palestinian-driven. Furthermore, the Israel-Palestinian/PLO wars of 1982 (in Lebanon), 1987-1991 (the First Intifada) and 2000-2004 (the Second Intifada) and Israel’s wars with Hamas in 2009 and 2012 (in Gaza) did not engage the Arab states militarily or financially. The Arab League and the U.N. did not raise the issue of a Palestinian state in Judea, Samaria and Gaza until 1967, when the issue was raised as a means to undermine the survival of the Jewish state. In fact, the Palestinian issue has never been a chief axis of U.S.-Israel relations. While the two administrations have never agreed on the Palestinian issue, their strategic cooperation has surged dramatically due to joint interests, mutual threats and shared values, which significantly transcend the Palestinian issue and the Arab-Israeli conflict. However, ignoring reality, Western policy makers consider the Palestinian issue the crown jewel of Arab policy-making, the core cause of Middle Eastern developments and the crux of the Arab-Israeli conflict. An erroneous underlying, Palestinian-driven assumption has produced an erroneous policy, radicalizing Arab and Palestinian expectations, fueling terrorism and inherent Middle Eastern instability, distancing the parties from peace and bringing them closer to war, and undermining Western national security and vital economic interests.